Cherry City Kitties : One Lucky Guy! So imagine my surprise when Mom, blog slacker that she's been told me that she was going to do a post today... just for me! She said it was a very special day because of 3 things. 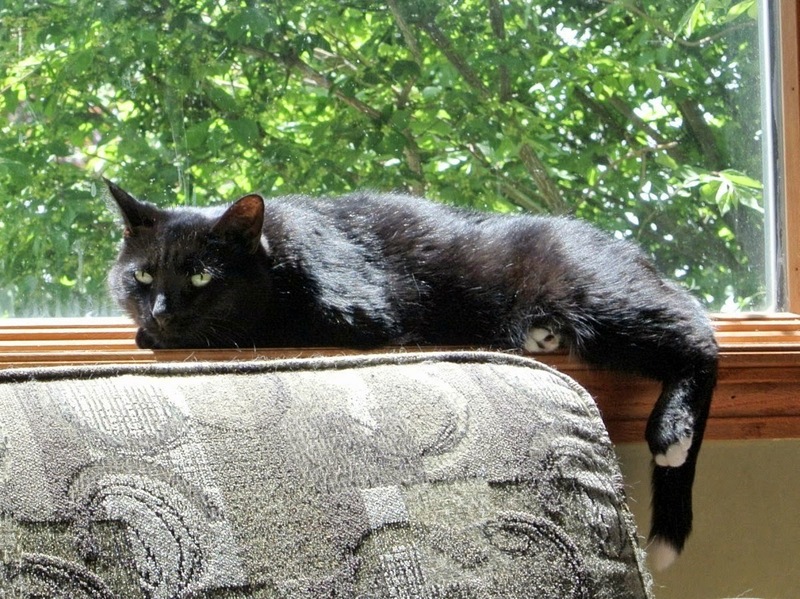 She said it was my day to be on the Cats of the Cat Blogosphere calendar, AND it was Friday the 13th and I was Black Cat, AND it was adopt a shelter cat month, so it was kind of an "all about me" time. Ok, so I know I'm not ALL black (they wouldn't call me Tipp otherwise), but in my heart I'm all House Panther! on Friday the 13th ???" It wasn't on a Friday the 13th, but that's what my Mom and Dad did with me, they adopted me from the UNCats Feline Rescue, which is a group that has a sanctuary for FeLV and FIV+ kitties. Mom said it was a lucky day for all of us! In Australia and Britain and other parts of the world where black is a protective color, black cats are though to be lucky. It was believed that their color gave them the power to ward off negative forces. Stroking a black cats tail can cure a sty in your eye? A black cat in the audience of a play means a successful run? If a black cat greets you at the door it is a lucky sign? Fisherman's wives kept black cats while their husbands went away to sea believing that the black cats would prevent danger from occurring to their husbands. These black cats were treated like royalty and were considered so valuable that they were often stolen. At one point, they became so expense that few fisher folk could afford them. Advocates of Feng Shui remind us that cats are drawn to harmony. Therefore a happy cat is the sign of a happy, harmonious home. A figurine of a black cat is often placed in the home, facing north, to ward off evil. In Finland black cats were thought to gently carry the souls of the dead to the other world. Anyway... I'm feelin like a pretty lucky guy today, so Happy Friday the 13th everyone, and I'm glad to be crossing paths with you all on this very special day! Of course House Panthers are pawsome ! There used to live one in my house for 17 1/2 years ! We agree...black cats bring luck! Happy Friday the 13th!! Mum was owned by black cat a long time ago. She got him from the Cats Protection League in the UK. She went to choose 2 kittens but he climbed up the leg of her jeans - she put him down and this went on time after time until she gave in and brought him home! If a dog came up to her in the street and she went to pat him he would see the dog off in a moment. She was definitely his!! Happy Caledar Day! We think you're a gorgeous house panther. Our Mommy just loves the white tips on your paws, too. Adorable! Black cats are good luck over here. We think you are a wonderful house panther too. Have a fabulous Friday. Just saw handsome Tipp on the Cats of the CB Calendar today and came to visit. 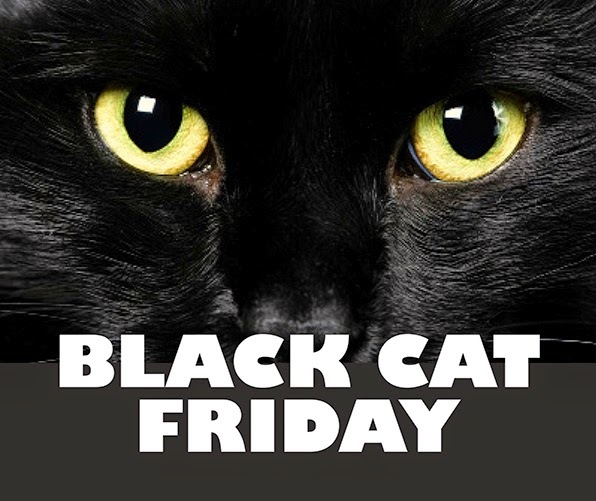 Great post- love all your black cat factoids. Black cats are so beautiful, it's very hard to understand why they are often overlooked at the shelters. Paws up, Tipp! Although I do think that EVERY day is your day! We agree that House Panthers are good luck! We's always liked black kitties and Friday the 13th. Happy Calendar Cat Day to you Tipp. The day was made for you. Happy Tipp Day on the Cats of the CB Calendar! We love you, our handsome honorary bro! You are a very handsome house panther. My mum used to have two black brothers, and the third brother was a tuxie. I never met them but Kitty Yumbum was half sister to them. Black cats are soooo fabulous, every house should have one!!! What a purrfect post!!!! Thank you for sharing!